The inspiration for this recipe came back in January when I was working for some of Ryan’s family friends (Bob and Randy) in Los Angeles. My job description was to organize their home office and do some administrative things, and it quickly turned to personal chef for their weekly Shabbat dinners after about two days. Bob is a food lover like myself, and we went back and forth exchanging his traditional Middle Eastern recipes with my modern, healthy recipes. We spent more time in the kitchen than doing anything else and it was seriously great. I introduced him to my Curry Cous Cous, which I think became a staple for their weekly dinners, and he introduced me to his chilled eggplant salad. This is my take on his salad with some slight variations. Bob served his with diced pickles and peppers, I am varying mine with sun dried tomatoes and roasted peppers to give it an earthier taste. Chilled eggplant is a great side dish or appetizer in the summer; if you wish to serve it as an appetizer, add some crunchy crostini with olive oil for a nice accompaniment. You can also serve this hot as a great addition to grilled chicken or fish! Heat a large sauce pan over medium heat with a drizzle of olive oil. Saute the garlic and onions for about 3 minutes, or until the onions start to become translucent. Add the tomato paste, slightly increase the heat, and saute for another minute. Add the white wine and scrape the bottom of the pan. Add the remaining ingredients with the exception of the fresh basil. Stir so that everything is incorporated, lower the heat to medium, and cover. Cook for about 15 minutes on medium heat or until the eggplant is softened. Season to taste with salt and pepper. 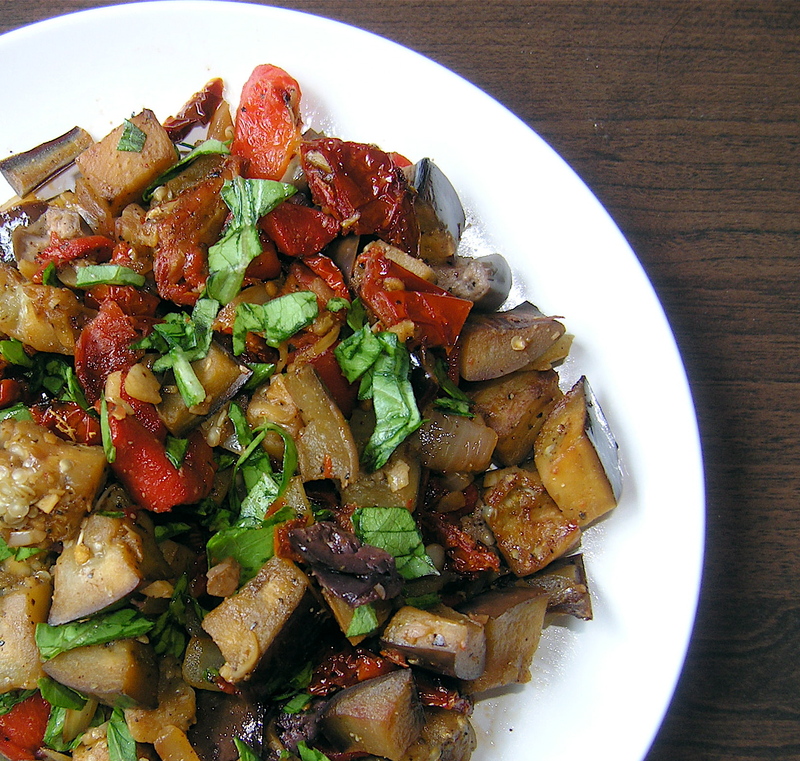 Remove the eggplant from the hot pan and let cool for about 10 minutes before placing in the refrigerator. If you are serving it chilled, cool at least 30 minutes, up to overnight, before serving. Roughly chop the fresh basil and toss in before serving . Otherwise serve directly from the pan and toss with fresh basil. I just made this for a dinner party for 12 people, and served it on the side with grilled salmon. I doubled the recipe. It was wonderful! I will definitely make it again!